There is no need for adhesive eye patches that can cause pain and frustration. Patch Pals has designer cloth eye patches for children, adults and babies. Our decorative eye patches are approved by ophthalmologists and optometrists for treatment of lazy eye, amblyopia, strabismus and post eye surgeries. Patch Pals provides a variety of reusable eye patches. Some styles can be worn with eye glasses and others without. Our custom cloth patches come with many design options including embroidery, iron on images, and decorative stickers and jewels. Take some time to explore our website which was designed to comfort and encourage eye patchers. My daughter Mackenzie was diagnosed with severe amblyopia when she was 3 years old. We had no idea that she was not seeing well with her left eye. We began eye patching her every day, all day long. Not surprisingly, patching compliance was the source of many battles. Click here for a Patch Pals Order Form for a fax or to mail in orders. Share a photo of your child wearing their Patch Pal eye patch and receive a 20% discount on your next order! 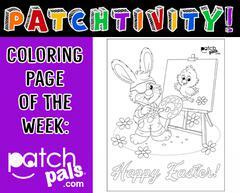 Just email your photo (jpeg, jpg, png) to PatchPals@aol.com, we will email you a discount code.